loved the fur vest,we are still waiting here for the weather to be a little colder,but will take another month i guess ! Thanks Veronica for stepping by and following! I am following you too! Thank you for visit my blog. I'm now following you. This look is gorgeous! 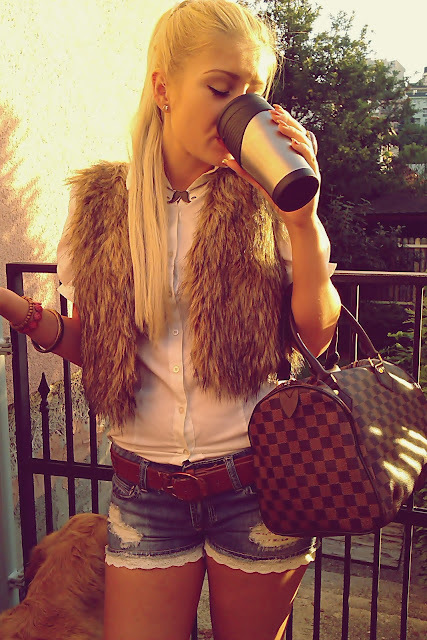 That vest is stunning! wow honey this outfit is amazing! I love the outfit! You look stunning! I love the necklace! I love the look ... Thanks for following me, I'll follow from now. You look stunning! Your hair is gorgeous! I also like your dog:) Thank you for following me, I am following you right back. thanks for stopping by, happy to follow you back here and on bloglovin' (*43)! Nice blog! :) OFc i follow U back. Great pics! :) I follow you too! And of course I follow you back with GFC and Facebook. But could you liked my funpage with your private account, because now your "Like" isn't count to the number of "Likes"? you are so beautiful and your outfit is just wonderful! Thanks for your sweet comment on my blog and following! such a chic, lovely outfit here dear! i love the shorts with the hint of lace and the fur vest. beautiful outfit!! love the fur vest alot :) you look gorgeous. I love your outfit! so great! Such cute little denim shorts with the little white trim,looking stylish for the cooler months ahead,can you believe its the end of summer already? Fur vest is at the top of my fall shopping list! P.S. Thanks for stopping by my blog and for following me on GFC, Twitter, and Facebook. I'm following back! Lovely! You look beautiful, like the shoes and shorts! Wanna follow each other? I started via GFC and Bloglovin!